YOU have been a key supporter of Lake Forest Sailing's Adaptive Sailing program this season because your club gave a $100 scholarship that allowed one disabled person to take six 2 1/2 hour lessons aboard Barb, the boat with the big number 8 on her bow that is parked four spaces west of the electric mule dock. Adaptive Sailing is a term created to help describe recreational and competitive sailing done by sailors with physical or visual handicaps. It is a competitive sport; internationally it is part of the Para Olympics, in Chicago it is the North American Challenge Cup regatta at the Chicago Yacht Club, and next season Barb may join the LFYC's Thursday night race fleet. 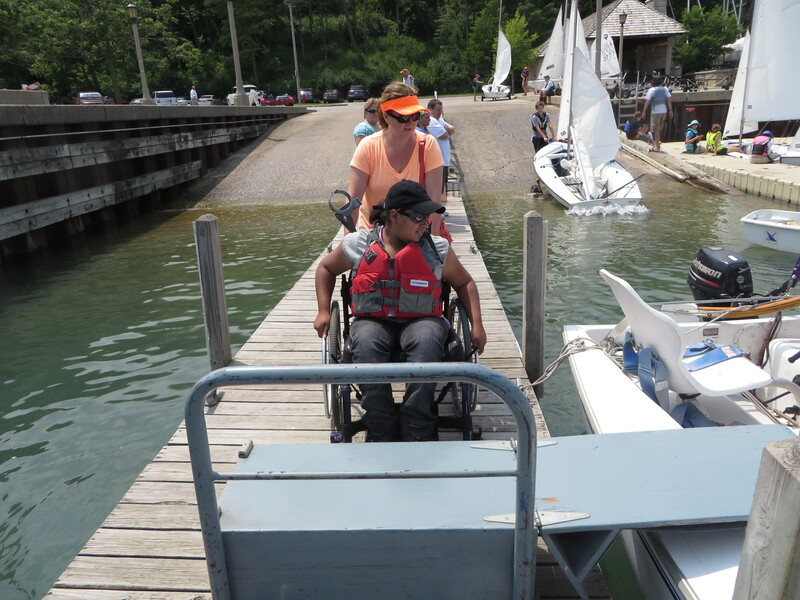 Barb was placed in Lake Forest by the Judd Goldman Adaptive Sailing Program of Chicago and it is used with disabled sailors by the Lake Forest Sailing Program of the Parks and Recreation Department. In Chicago, Judd Goldman has seven more boats like Barb, eight Sonars, and four one-person 2.4 Meter boat. All for disabled sailors. The Sonars and 2.4 Meters are used for international competitions, the basic trainers are the boats like Barb, Independence 20s. The use of these boats is among the Park District management responsibilities of Joey Harris, former Lake Forest Sailing supervisor. Unique to the Independence 20 are the special seats, a part of Gary Mull's design. He designed many notable boats including the Catalina Capri 22, the Santana 22, and the Buccaneer 18. THE BOAT. The first Independence 20 was built in 1986 after a study by a group from the governing body of US sail sport. Yacht marketer Freedom Yachts had the boat designed by the late Gary Mull, designer of popular small craft including the Catalina Capri 22, Santana 22, and Buccaneer 18. Boats were first built by Pearson and later by Cataline. The design incorjporates a freestanding mast without stays, an 800 pound keel, a self-bailing cockpit, and lots of flotation. Roller furling, a jib boom, and lazy jacks for the mainsail are other features. She is beamy, with the eight-foot beam carried well aft for maximum stability. As the first US boat built specifically for disabled sailors, she featurs two Mull-designed chairs that can swing from port to starboard. A 120-pound counterweight attached to a floorboard lever helps the chair move. One chair is located aft for the helmsman, one forward for the trimmer. Group sails of potential adaptive sailors are promoted by the Great Lakes Adaptive Sports Association, headquartered in Lake Forest. Adaptive sailor Barry is working with instructor Will Howard on sailing by the telltales while newbie Mike learns to enjoy being on the water. mpetition before suffering a heath setback. He was taking his fifth lesson in Lake Forest as part of this recovery effort . In addition to sailing, Barry plays golf in the Adaptive Sports and Fitness program of the Rehabilitaiton Institute of Chicago which offers over 15 sports ranging from archery to wheelchair rugby. Mike is a new sailor, a stroke victim recruited to sailing as therapy by Barry. But he already has learned to love being on the water. 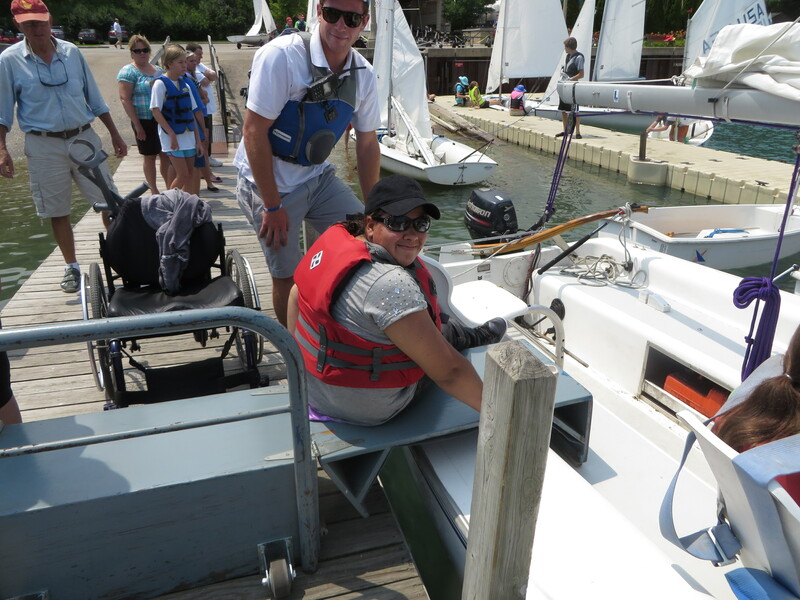 In addition to training sailors like Barry and Mike, the program plays host to groups of young people with disabilities who participate in programs promoted bythe Greast Lakes Adaptive Sports Association headquartered in Lake Forest's Gorton Center. GLASA organizes and promote fitness, recreational and competitive sports activities for youths and adults with physical and visual impairments. Sailing on Barb introduces them to another sport they can master. Instructor Will Howard has to teach special skills including use of the transfer box which forms a bridge from a wheelchair to the boat. THE TEACHER. 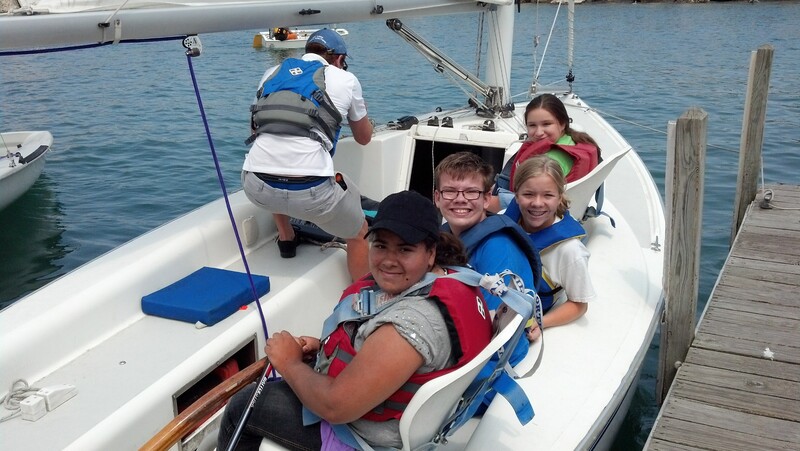 Will Howard, who has been the adaptive sailing instructor for both the two short seasons the program has been in Lake Forest, believes his students get a lot out of their experience on the water. Being able to control the boat gives them a feeling of empowerment.. And he finds them pleased to look no different, and to act no different, than any other sailor on the water. In other sports the adaptive participant may look a lot different -- the wheelchair shows. Will also believes sailing is good physical therapy, particularly building upper body strength. And it is emotional therapy too, with students benefiting from getting out of the house to forget their pains while they sail. A business management senior at the University of Miami, if time permits, during the college year Will hopes to participate in Miami;s Shake-A-Leg adaptive sailing program which serves over 2000 adaptive sailors annually. He wants to continue teaching adaptive sailing because it is a kind a sailing he finds more fun than racing.